I’m a Dropbox partisan. 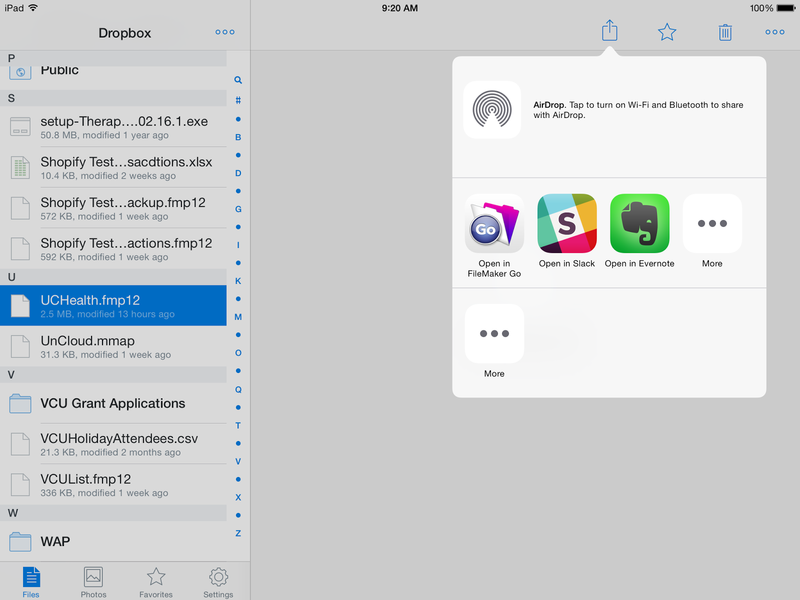 Dropbox works really well between multiple platforms as “personal cloud”. 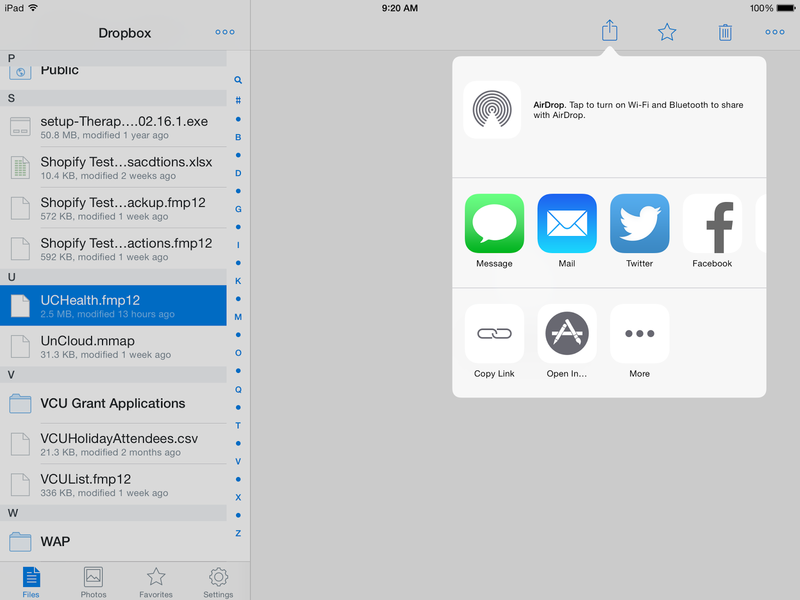 The wonderful thing about Dropbox is that it allows you to work locally on a file, whether you are connected to the internet or not, and then it will synchronize any changes that you have made to the source file in the cloud. This can legitimately be called syncing, because you end up with the same version of the file on all devices (and the cloud folder), once the changes have been made. Even with the Dropbox app installed, the familiar syncing process that works so smoothly on desktops and laptops isn’t present on the iPad. The reason for this is that on actual computers Dropbox maintains copies of all files on all devices and the cloud. On the iPad that might be both a problem with storage space, and also a problem with the amount of data that is transferred. 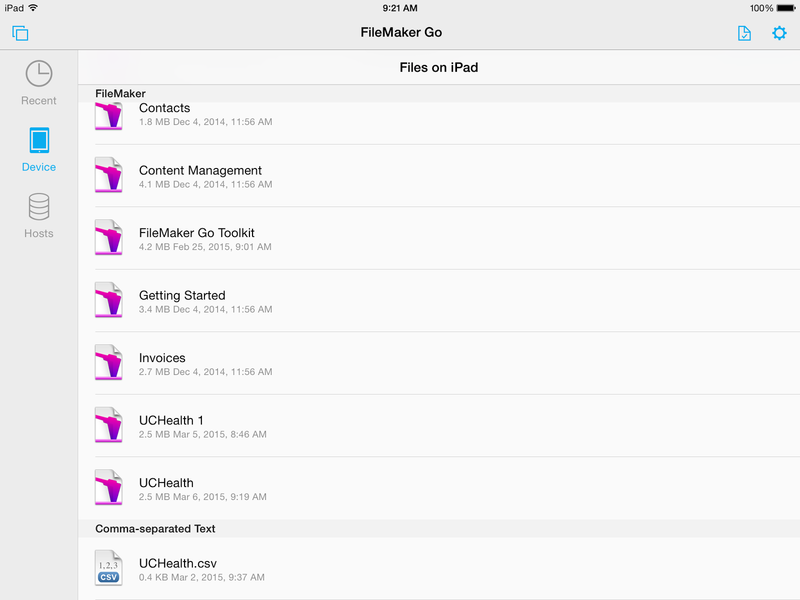 This has come up with FileMaker files that are opened using the FileMaker Go app on the iPad. I’d prefer to go to the Dropbox app, find my FileMaker database file, and “Open in FileMaker Go”, which is, in fact the procedure that one uses to download and use the FileMaker file on the iPad for the first time. 1. Here’s the file shown in the Dropbox App. 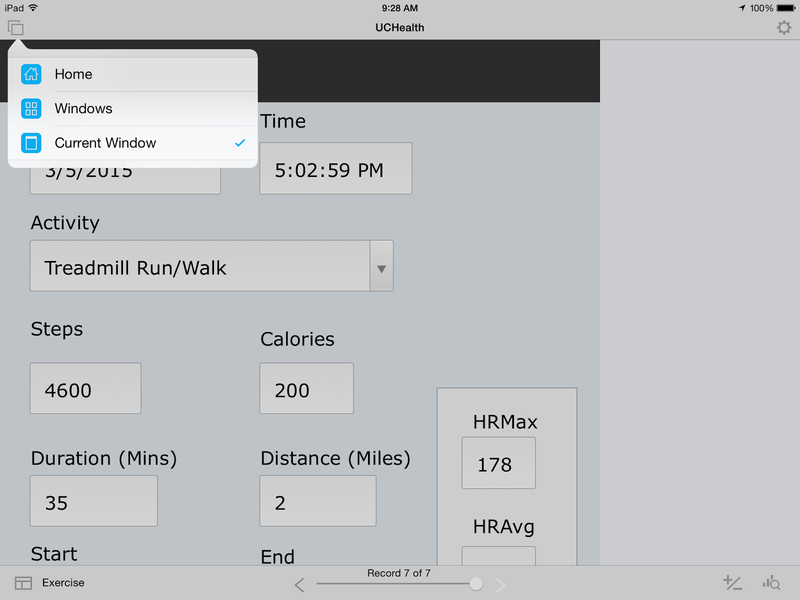 It is called UCHealth.fmp12 and it is an exercise tracking application. 2. Choose the file, then, choose the Open icon (third from the right on the top, the box with the arrow). 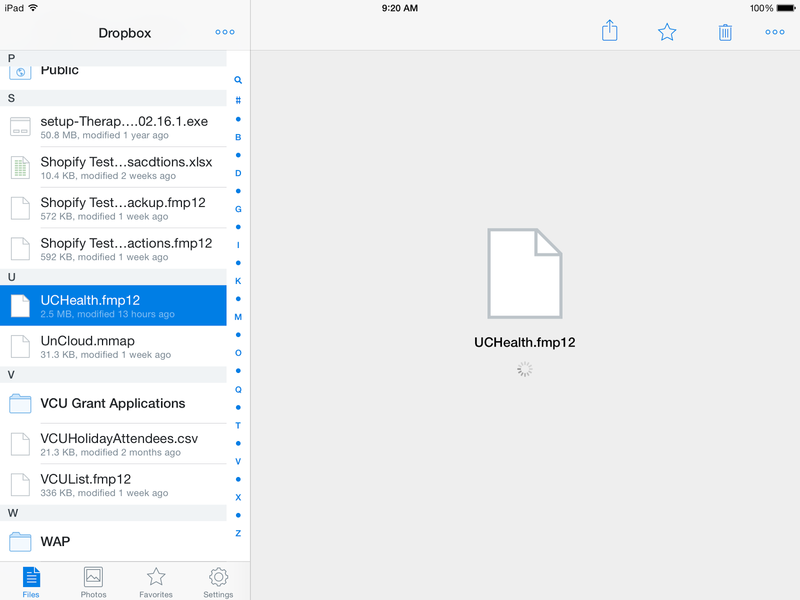 However, once the file is opened, it is copied to the iPad and it stays on the iPad. 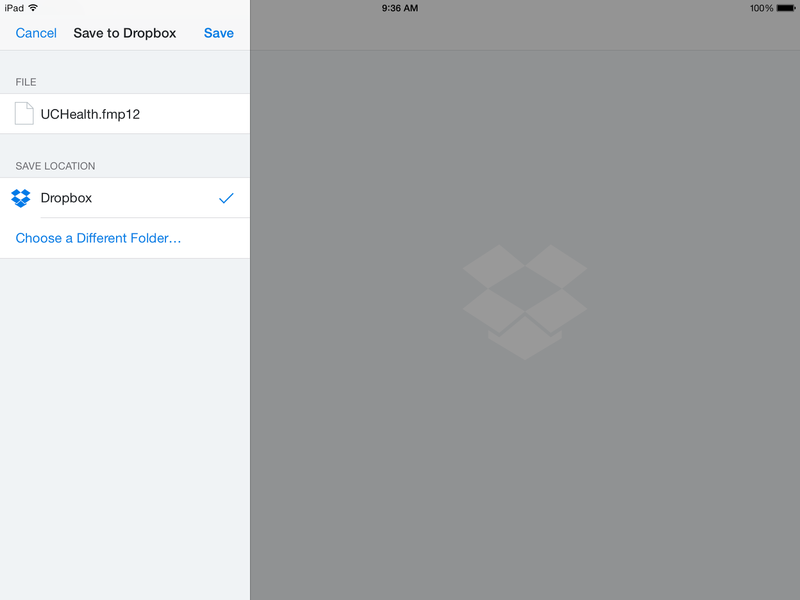 Changes to the file (new records, edited records, etc), are NOT synced back to the Dropbox cloud file. The fix for this is a bit convoluted, but at least it works. It involves a manual copy of the file back to the Dropbox cloud. 1. In Dropbox, Delete the cloud version of the file. (If you are doing this next to your desktop computer you may see a notification on the desktop telling you that the file has been deleted from Dropbox. 2. 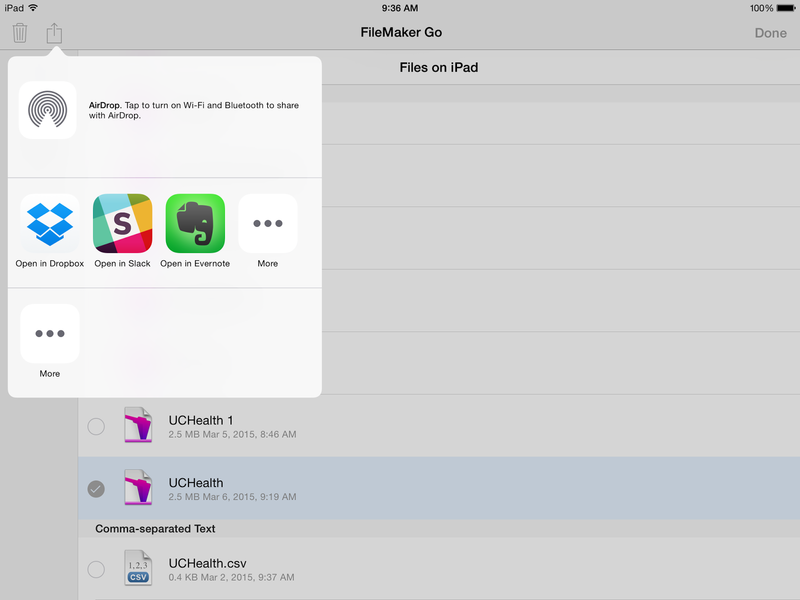 In FileMaker Go – be sure to close the file. That will bring you back to the file browser. 3. 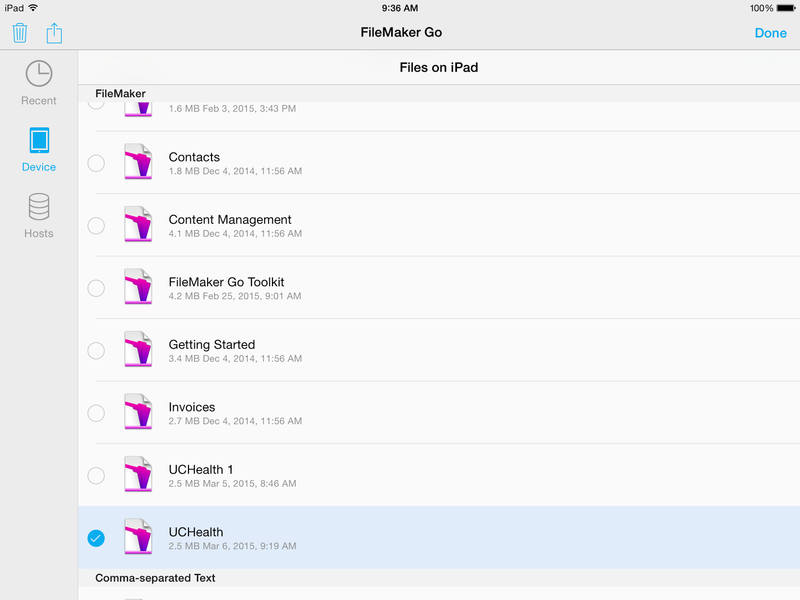 In FileMaker Go, choose “Device” This will show the list of files that on the iPad. 4. Choose the upper right icon to “mark” the file. This is the (turned down page). Depending on the size of the file there may be a delay as the file is copied to the Dropbox. And of course, this process doesn’t work unless you are connected to the network. This whole process isn’t elegant, and is only workable for a single person moving files around. But it works. This entry was posted in Uncategorized and tagged Apple, FileMaker, http://schemas.google.com/blogger/2008/kind#post, Networking, Workflow on March 6, 2015 by lkeyes70.